For the art of stunting, see Stunting. 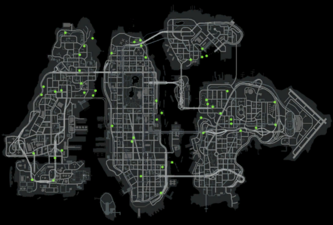 The map displaying all Unique Stunt Jumps in Liberty City in Grand Theft Auto IV. Jump to a new level of spirituality. Unique Stunt Jumps (named Unique Jumps in the GTA III Era; later renamed Stunt Jumps in Grand Theft Auto IV) are a feature in every Grand Theft Auto game since Grand Theft Auto III (with the exception of Grand Theft Auto Advance). A Stunt Jump usually involves using a vehicle or motorcycle to jump of a ramp of some sort (sometimes an actual ramp, or something similar to a ramp like a slanted roof or staircase), then to catch a few seconds of airtime, then land on the ground without dying. The game tracks these for your stats, and completing all is usually required for 100% completion. Each unique jump has pre-defined takeoff and landing areas; miss either, and the jump is incomplete. If your vehicle hits the takeoff area in more-or-less the right direction, the game switches to a slow-motion cut-scene panoramic view as your vehicle launches from the takeoff area. Upon landing, indication of success is given, while an unsuccessful jump will receive no message. Some jumps require high speed, thus are only feasible on a fast motorbike such as a PCJ-600 or NRG-500, and sometimes also require the character to lean forward on the bike for increased speed. In other jumps, too much speed may lead you to overshoot the landing area. In the GTA III Era, there are also Insane Stunt Jumps, which aren't required for 100%, and don't have to be done at a set location. They pay different amounts depending on the difficulty of the stunt. Stunt jumps first appeared in GTA III, and have been in every game since except GTA Advance. Early GTA games gave no indication to distinguish failed unique stunt jumps from those successfully completed. To address this, modders have developed add-on tools such as Demarest's Uniquecall to list or show on the map which jumps remain. Grand Theft Auto: Vice City Stories and Grand Theft Auto: Chinatown Wars give the player the option of showing completed jumps on the radar. Repeating a completed jump does not award the player money, but the player may still be treated with a cinematic view of the jump. GTA III introduced stunt jumps to the Grand Theft Auto series. There are 20 stunt jumps spread throughout Liberty City: eight in Portland, four on Staunton Island, and eight in Shoreside Vale. Compared to later games, the stunt jumps in GTA III are relatively easy. Completing a jump in GTA III adds $5,000 into each jump award (for the n-th jump, $5000*n). Completing all 20 jumps awards the player $1,000,000 instead of the standard incremental monetary award for completing the 20th jump ($100,000). There are thirty-six unique jumps in Grand Theft Auto: Vice City, and are most easily completed using the PCJ-600 motorcycle - some jumps cannot be performed using anything else. The jumps in GTA Vice City are more difficult than those in GTA III, some being much longer and even extending over water. GTA Vice City's award system for completing jumps is identical to that of GTA III, but the incremental reward and final reward are significantly reduced. Each completed jump adds only $100 to the reward pool (for the n-th jump, $100*n), and completing the 36th jumps awards only $10,000. On the iOS and Android versions of GTA Vice City, when the player completes a jump they have already completed, they are given the "Stunt Already Completed" message. There are seventy unique stunt jumps in Grand Theft Auto: San Andreas; most are quite difficult. The majority are situated beside each other, with very few being isolated. These jumps are relatively easy to find throughout the state of San Andreas, with fairly obvious take-off and landing areas. GTA San Andreas's award system for completing jumps is similar to its predecessors' in that each completed jump adds $500 to the reward pool (for the n-th jump, $500*n), but the final jump awards a regular incremented award rather than a larger final award (the final, 70th jump awards $35,000). Unlike other GTA games, completing all seventy Jumps in GTA San Andreas is not necessary for 100% completion. There are twenty-six stunt jumps in Grand Theft Auto: Liberty City Stories. They are spread evenly throughout the three islands. The game's rewards for completing jump is similar to that of GTA Vice City with minor modifications. Completing the first jump awards $100 and unlocks the "Underwear Outfit" in all three safehouses' wardrobes. Completing succeeding jumps adds $250 to the reward pool (for the n-th jump, $100+($250*(n-1))). Completing the final jump rewards the player with $10,000 instead of the standard incremental reward. The PlayStation 2 and PlayStation Portable versions of GTA Vice City Stories differ in the number of jumps. The PSP version contains thirty Stunts, and the PS2 version contains thirty-six. Unlike earlier games, completing each stunt jump will only reward the player a flat amount of $250. Completing the final jump awards $10,000. In the GTA IV version of Liberty City, there are fifty stunt jumps. Completing all fifty will bring the player two ticks closer to 100%. Completing all fifty unlocks the Daredevil achievement, awarding 30 gamerscore on the Xbox 360 and PC or a silver trophy on the PlayStation 3. There are major changes in unique stunt jumps from the earlier games to GTA IV, the largest being that the player no longer collects money for doing stunt jumps. Another significant change is that instead of landing without crashing like in previous games, the player must land directly on the destination area. The cinematics that trigger from performing these stunt jumps are still available in The Lost and Damned and The Ballad of Gay Tony, but are otherwise not relevant to the episodes' gameplay. One of the Rusty Brown's Ring Donuts billboards that marks a Unique Stunt Jump in GTA Chinatown Wars. In a change for the series, each Unique Stunt Jump in GTA Chinatown Wars requires the player to destroy one of thirty wooden Rusty Brown's Ring Donuts billboards with a vehicle. Despite each billboard having a ramp leading up to it, the player technically doesn't have to "crash" through them, as any part of the vehicle can be used, even a single tire gliding down. After a billboard has been destroyed, it is replaced in-game with a shoddily-repaired model, making identifying uncompleted Jumps easier. As is with GTA IV, there is no substantial reward completing the stunt jumps aside from 100% completion. This page was last modified on 4 March 2015, at 02:33.